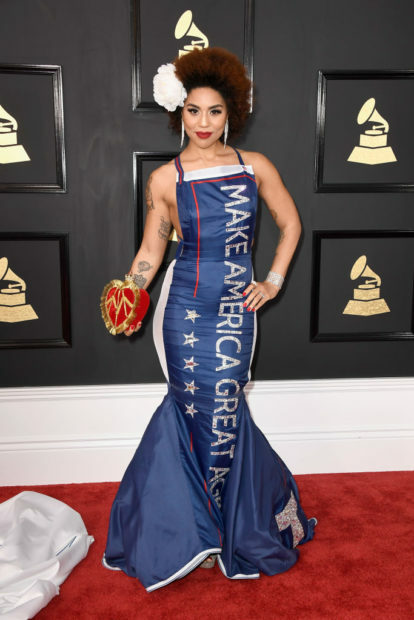 Conservative musician Joy Villa made a strong statement with the dress she wore to the Grammy Awards Sunday. 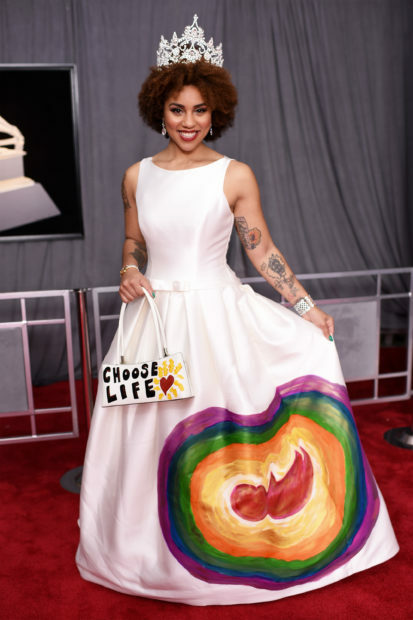 Villa wore a white gown with a painted unborn baby surrounded by rainbow colors, and carried a purse with the phrase “choose life” printed on it. Other artists and attendees at the music industry’s biggest awards show wore white roses to show support for the Me Too movement. No stranger to making statements, Villa wore a dress to the 2017 Grammys that said “Make America Great Again,” President Donald Trump’s slogan. An avid Trump supporter, Villa said she is pleased with the job Trump is doing as president. She even wrote a song about making America great again. “I am looking forward to seeing Americans [feel patriotic] again. I’m glad that conservative values are back at the forefront as a pro-life woman,” Villa said. Villa, a vocal Scientologist, is a bit of a political chameleon. She supported former President Barack Obama’s 2012 election, and was excited at the prospect of Sen. Bernie Sanders getting the Democratic nomination in 2016. She is also considering a congressional campaign herself in Florida, something she says Ivanka Trump wants her to do. “I was at the White House the other night. And I got to see the president at the White House Christmas party,” Villa said in December.